This post is part of a multiple-series guide about Online Marketing For Small Businesses. In this post I will discuss the basics of getting people to visit your website by explaining location based and local marketing, blogging, email and affiliate marketing. In the previous part I talked about search engine optimization and online advertising. In this part I’m going to talk about other online marketing channels you can use to drive traffic to your website and/or your physical store. If you are well presented on location based service platforms, such as Foursquare, people who search for your kind of business can easily find you and are more likely to visit you. You’re able to reach all mobile device users nearby who are doing a local search. In fact, 48% of all mobile users in the US are making local searches on their devices. As I already mentioned, almost half of all mobile users use their device for local searches and the majority uses Google Search. Therefore, displaying location-based mobile ads on Google can bring many customers into your store which, initially, saw your ad on their smartphone. The big advantage here is that mobile ads can be highly targeted. For example, you could set up ads, which are only displayed with a click to call extension in a certain area and a specific time period. If you have a marketing budget, I recommend trying out mobile ads, either by doing it yourself or with the help of an online advertising agency. Before you get started, check out our online advertising beginner’s guide if you are not yet familiar with the topic. 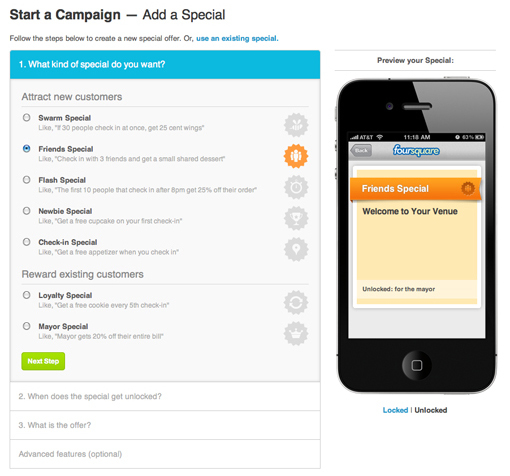 Location based apps are a great way to lure consumers into your shop. These services are either for free or low-cost and very targeted. One of the most popular apps is Foursquare. Because of its 33 million users and 3.5 billion location check-ins since its launch 2009, businesses should seriously consider using it in their marketing strategy. Using different approaches and services you can get more customers and increase your revenue. You should find out which services your target group is using and focus on them. However, I recommend using more than just one. Being present on several location based platforms increases your reach and will likely bring in more customers. Only a few small businesses are using location based apps properly, which gives you the opportunity to get a head start and steal away potential customers from your competitors. Normally, you don’t get location based app users into your store that easily. You need to give them a good reason to enter your store. Use incentives for “check-ins”, such as a discount or a free product if they check-in for the first time. This way you can especially attract new customers. Getting new customers is much harder than keeping existing ones. Put yourself into the position of potential new customers and think about suitable incentives, which would convince them to pay you a visit. Obviously, it is crucial to turn existing customers into loyal and returning ones. With location based platforms, you can make this transition easier and reward loyalty. For example, with Foursquare, you can offer rewards (free coffee, discount …) to customers, who checked into your store several times or are the so-called “Mayor” (the person who has checked-in the most in a certain time period becomes the mayor). Think of the rewards as a digital version of the traditional stamp cards (e.g. 10th visit is for free). Times of the day in which business is slow can be a real pain. So why not offer special deals in such time periods to drive sales? It is always better to make sales with a lower profit margin than no sales at all, right? You can use location based platforms and mobile ads to set up special discounts or free products which are only available in your defined time period. For example, you can create an ad campaign in AdWords, which displays ads only at specific times to advertise a 20% discount for students. This way, coffee shops or bars could lure students to their locations when they leave the university. Usually, location based services offer its users the possibility to give ratings, reviews and tips about a place they have visited. Every business owner knows by now that consumers value reviews a lot, it is important that your customers leave reviews. Reviews can help you to see what your customers think about you and the way you do your job. Look at what your customers say and react on their reactions in order to improve their experience. Encourage your customers to write reviews. Best approach would be to offer them something in return. Having a blog with frequently updated content is a good way to increase website traffic. Every blog post is one piece of content more than can drive traffic from search eng. Furthermore, a business blog can establish you as an expert of your industry, which increases your credibility and trust. If you have a local store, I recommend that you write about topics that are not only general but also local. This way you can also reach potential customers searching for relevant local keywords. Do I have the resources (time, staff …) to write articles on a regular basis and promote them on social media and other channels? How much of an expert am I? Am I able to write unique and valuable content? What are my goals for the blog? If you’re still eager to start blogging after asking yourself those questions, I recommend to use WordPress, a content management system, which is very user-friendly and easy to set up. Despite of the bad reputation email newsletter might have, they are still a great way to communicate with subscribers and turn them into customers (again). However, you need to be very careful what you send out. There are a lot of things you can do wrong, which drive away your target audience and make them unsubscribe from your newsletter. There are many email marketing tools out there to make our life easier. I can recommend Mailchimp, which we use here at trendblog. It’s very easy to understand and user-friendly. Getting traffic to your website and, eventually, to your store is a real challenge and can be quite some work. However, if you have a good inbound marketing strategy and clear goals you can see positive results relatively soon. Never end up in a routine, always try to test and improve your approaches. In the next part, I talk about how to analyze your website’s traffic using different tools. If you have any questions, feel free to post them in the comments. Make sure to subscribe to our newsletter and social media channels to stay up-to-date!